Ever since I saw these no pull flexible hair rings at Kohl’s, last Black Friday, I wanted them. But there was no way I was going to dish out $8 for three pieces of plastic. Come on! To me, you should be able to get these hair ties for a quarter each, so I just waited it out. BTW, You can find them in that little area right before the cash registers. You know, the area that all the stores place over priced items to feed on impulse buyers while standing in a line that resembles a snail race. Yeah! That area. So for the past six months I’ve been waiting for them to either go on sale, or drop in price. But nope! They have remained the same. They come in your basic hair colors. Black, brown, and a tan blonde shade. Several months ago while shopping I brought them up to the cashier and asked her if they were really $8? Then she told me they are probably $4-$5 dollars. Max. After all, she is employed by Kohl’s, she can’t tell me they are not worth it. Or act surprised at the price. Could she? She asked me if I wanted them. I replied no. And then she whispered that she doesn’t blame me. I’ll be the first to admit, nowadays, I am the typical basic consumer that wants something that is over-hyped and hard to get a hold of. But I’m also stubborn. In the fact that my frugalness will not allow me to pay retail. Ever! This takes us to last week when I opened my mail box to find a $10 off coupon from Kohl’s. I quickly read the fine print to make sure that I didn’t need to shell out $50 to receive the $10 off. Although there was a $50 bottle of parfum I was also eyeing at Kohls…but I know I don’t need another over priced bottle of perfume, when I have more sitting on my dresser then I can ever wear in a life time. After reading the fine print I saw that it was one of those…. come to kohls and buy anything for $10 and get the $10 item free. If you are able to only come in and buy one item, then leave. Like Target, who in their right mind can go to Kohls and only buy one item and leave? So I went there and used the coupon for the over priced hair rings. Ya-hoo! Then I came home to show my oldest daughter my unique, or so I thought, find. 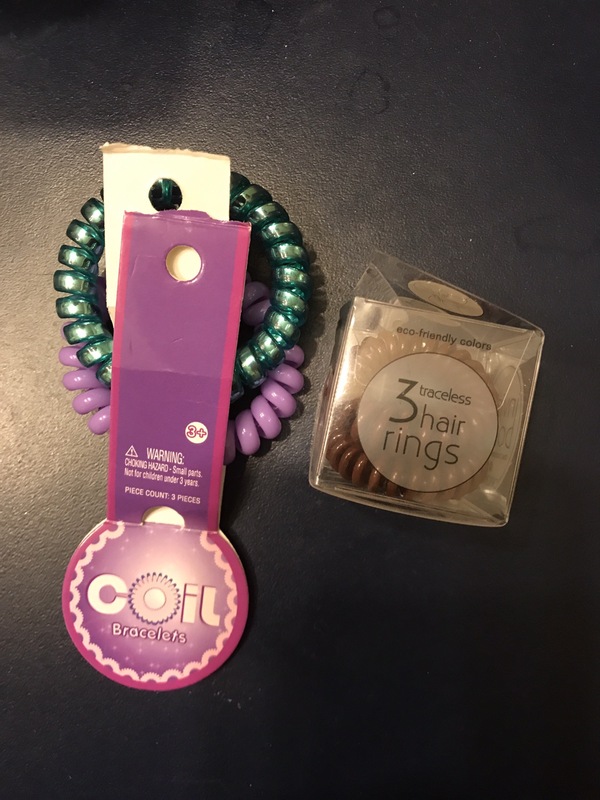 You get three hair rings in the cutest cubed package. I handed one over to her to try out first. She placed her long hair in a high bun and twisted the hair ring around once. Pleased that it held a tight high bun, she smiled and said that it felt like nothing at all. No pulling or weighing down the head. I then tried one out, having to twist it around twice because my hair is shorter and thinner then hers. It felt great! Exactly the way I expected it to feel. And all for free! It took me a moment to scan all the popular girls bracelets that have been popular throughout the years… jelly, slap, silly, friendship, pen bracelets…And yes! Those twisty ones! Ugh! After having a moment of anger verses sadness, I kicked those feelings aside and continued to love my free over priced hair rings. Last night while shopping at Walmart with same daughter, she came across the girls 90’s coil bracelets. $1 for a pack of 3! Sure, they are bright colors. No neutrals, which is what I tend to stick with, but they had them non the less. 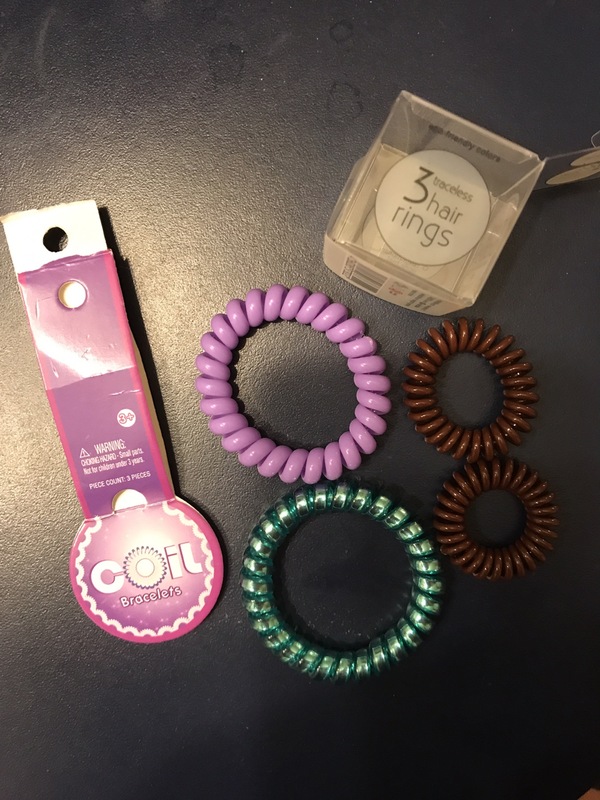 They are also made alot better then the over priced hair rings and while they are a bit bigger in size, they still feel like nothing in your hair. Yes, of course I bought them …and have already worn one to the pool. The bright pick one, which is why it’s not shown here in the pictures. And the brown original hair ring that I gave yo my daughter is also not shown here. But I wanted to show a side by side comparison. And I would still never, ever, pay $8 on any hair accessory..
Ah….America. Marketing capital of the universe. Find a new use for something, up the price and sell, sell, sell.